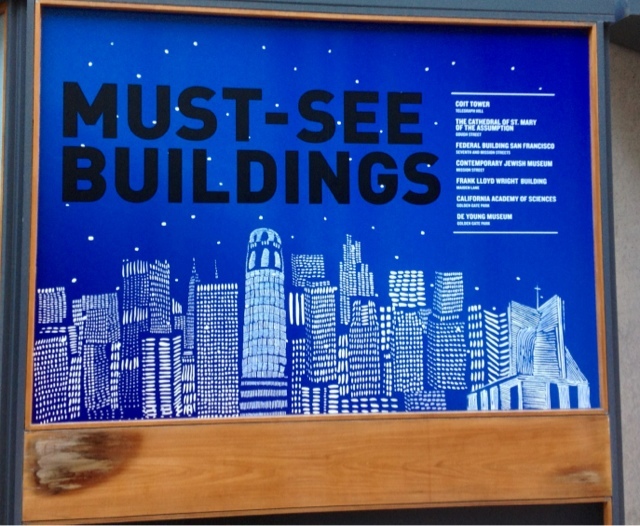 If you had 2 or 3 days in SF, what would be the top 7 must see buildings? The new museums? Old towers? Or a washing machine inspired cathedral. Me thinks the ferries and city halls are missing. More thoughts and lists after the break. The drawing in the image two buildings from the list, but interestingly several not on the list. Coit Tower and the Cathedral of St. Mary are shown prominently. However, we also see a sliver of the Transamerica Pyramid, One Embarcadero Center and what appears to be 505 Montgomery with its distinctive trapezoidal crown. The image was found on Washington Street in the Financial District, but it has no credit. An image promoting San Francisco Made products appeared next to it. As noted in the intro we noted that there are several buildings we would consider "must-see" that are not included, while some on the list are less relevant in our eyes. Of course, the "must-see" or "best" buildings or architecture in San Francisco are up to the observer. Below are a few other buildings to consider. Feel free to chime in with your top 7 "must-see" buildings in San Francisco or other cities. Many others have made similar lists. Check out the SF.Curbed list here. I believe this might be from 7x7 because I now recall (after looking through my photos) that there was another window poster like this about 7x7. That might explain why the list only includes 7 buildings. Great, I like the post..I'm impressed by these building signs..Thanks for sharing!! FARINA Pizza & Cucina Italiana UNVEILED!